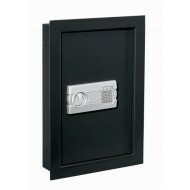 This Mesa adjustable wall safe is designed to provide hidden protection for documents and miscellaneous valuables. The adjustable depth of the MAWX2113E wall safe gives you the ability to maximize and utilize all the usable space when installed in different wall thicknesses. 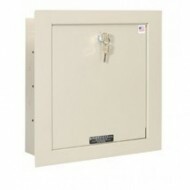 The wall safe installs easily between 16'' on center wall studs. Start protecting and concealing all your valuables such as classified documents, jewelry, certificates, passports, cash and other valuable possessions inside a hidden safe. 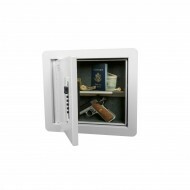 If wanting to access the safe during the night where lighting is poor or completely dark, there is an interior light that can be easily accessed with just a flip of the switch.The advantage of a wall safe is that can be cmpletely hidden simply by covering it with a painting, sculpture or book-shelf for unseen security against thieves and robbers. 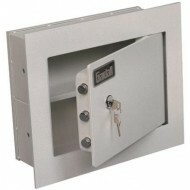 The battery-operated electronic lock provides easy access for users and safeguarding against burglars. You can easily change your personal code in a matter of seconds. The electronic lock has a lockout penalty feature where if multiple incorrect combinations are entered, the unauthorized user will no longer be able to enter any more combinations. 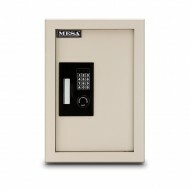 If you happen to misplace your code or the batteries die, Mesa has provided an override key to access the safe.